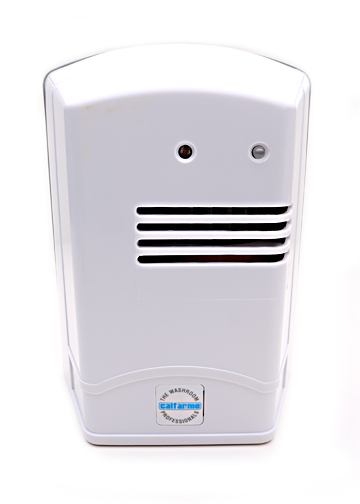 Battery operated air freshener dispenser specially designed to operate on 1 or 2 "D" Cell Alkaline battery, lasts over one year. It is ideal for home use especially in bedrooms, bathrooms and sitting rooms. Likewise for commercial applications at reception areas, hallways, washrooms and guest room in the hotel, restaurants , healthcare centres, sports clubs and wherever a clean and natural refreshing environment is desired. Auto‐light sensor shut off unit when light off with various setting (light, medium & strong mode). This feature extends the optimum service of each 40ml sachet refill that last at least 60 days for most usage situations. It is available in ABS White Cover, and Polycarbonate Transparent Cover. - Select Auto-light sensor to ON/Off (ON - for automatic shut off when room is dark without light or night). - Select ligth, medium, or strong mode switch. Light: 6 minutes On/3 minutes OFF. Medium: 1 minute ON/1 minute OFF. Strong: 2 minutes ON/1 minute OFF. Tear open sachet and fill in the refillable wick cartridge and place inside the shelf below the fan. LED indicator will have green blinking light when unit in operation and red blinking light when batteries are weak (replace batteries). LED indicator stops blinking when unit is not in operation.